“David Bowie is dead, long live David Bowie. His creativity and commitment to reinvention and originality lives on in artists, musicians, and filmmakers the world over. 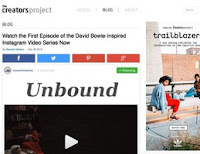 The filmmakers at Instagram's InstaMiniSeries got the chance to orbit closer to Bowie's celestial body than most who claim him as inspiration, for a new project called Unbound.” Full article here.